The top seed in the tournament scores 20 straight points to start the game and beat Abilene Christian. 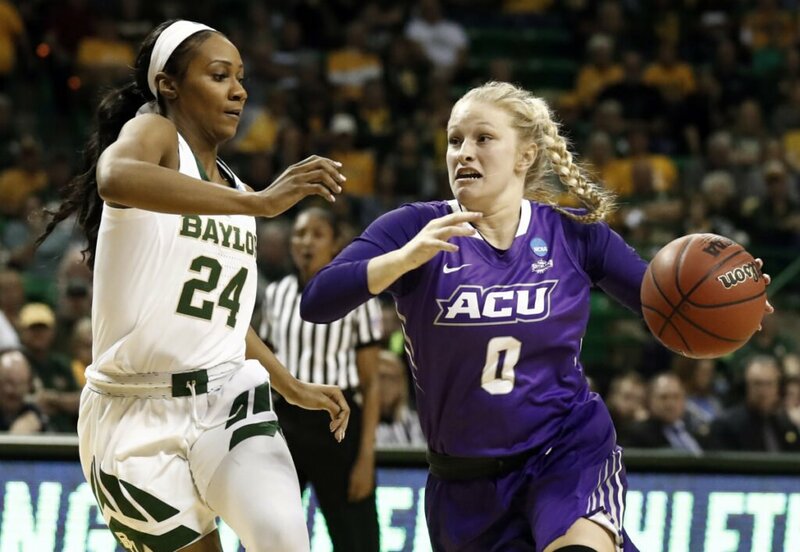 Associated Press/Tony Gutierrez Baylor guard Chloe Jackson, left, defends against a drive to the basket by Abilene Christian 's Kamryn Mraz in Waco, Texas on Saturday. 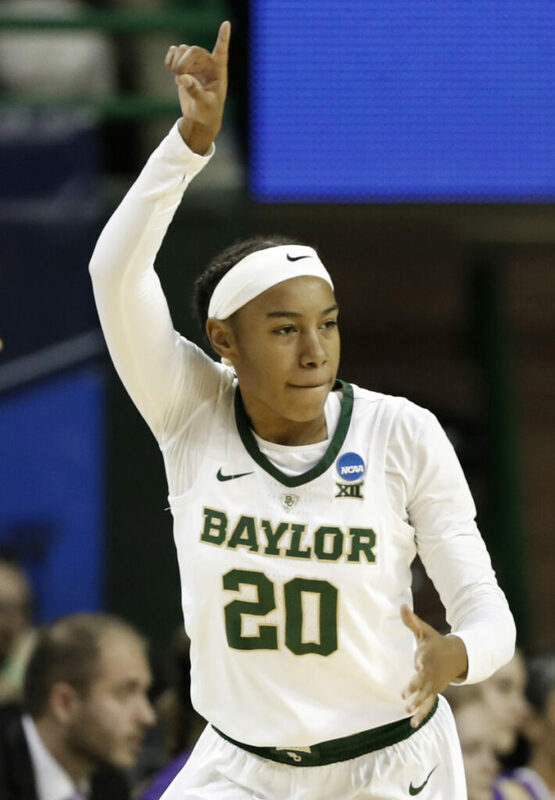 WACO, Texas — Kalani Brown had 17 points and 11 rebounds while playing only 18 minutes and top-seeded Baylor overwhelmed women’s NCAA Tournament first-timer Abilene Christian 95-38 in a first-round game Saturday. Brown, a 6-foot-7 senior center, had 10 of her points as Baylor (32-1) scored the game’s first 20 points. The perennial Big 12 champion Lady Bears, the No. 1 overall seed in the 64-team field, won their 15th consecutive NCAA Tournament game on their home court since 2011. This season, their 24-game winning streak is the nation’s longest and they have won 38 in a row at home. Lauren Cox, Baylor’s 6-4 post, had 14 points in 17 minutes and was on the bench with Brown and other starters throughout the fourth quarter. Juicy Landrum, another starter, had 14 points with three 3-pointers in 19 minutes. NOTRE DAME 92, BETHUNE-COOKMAN 50: Arike Ogunbowale scored 23 points and teammate Jessica Shepard had a double-double as the Irish (31-3) beat the Lady Wildcats (22-11) in South Bend, Indiana. Ogunbowale hit 8 of 15 shots while adding three steals for the Fighting Irish, who never trailed in the Chicago Regional game. MARYLAND 73, RADFORD 51: Taylor Mikesell scored 16 points, Kaila Charles had 14 points and nine rebounds, and the Terrapins (29-4) used a relentless defensive effort to overpower the Highlanders (26-7) in College Park, Maryland. Stephanie Jones added 12 points and Shakira Austin tallied 11 for the Terrapins, who advanced to the second round for the 15th time in 15 tries under Coach Brenda Frese. SYRACUSE 70, FORDHAM 49: Guard Tiana Mangakahia just missed a triple-double with 21 points, 11 assists and eight rebounds to lead the Orange (25-8) past the Rams (25-9) in Syracuse, New York. CALIFORNIA 92, NORTH CAROLINA 72: Kristine Anigwe extended her season-long streak of double-doubles with 18 points and 22 rebounds as the Bears (20-12) rallied from a 12-point deficit in the first half to beat the Tar Heels (18-15) in Waco, Texas. BYU 73, AUBURN 64: Brenna Chase had 19 points, seven assists and three blocked shots, and the Cougars (26-6) beat the Tigers (22-10) in Stanford, California. MICHIGAN STATE 88, CENTRAL MICHIGAN 87: Shay Colley’s driving layup with 7.6 seconds left lifted the Spartans (21-11) to a victory over the Chippewas (25-8) in South Bend, Indiana. MISSOURI STATE 89, DEPAUL 78: Alexa Willard and Danielle Gitzen each scored 20 points and the Lady Bears (24-9) stunned DePaul (26-8), snapping the Blue Demon’s five-game winning streak in opening-round NCAA Tournament games, in Ames, Iowa. GONZAGA 68, LITTLE ROCK 51: Katie Campbell had 15 points, hitting five 3-pointers, and the Bulldogs (29-4) downed the Trojans (21-10) in Corvallis, Oregon. UCLA 89, TENNESSEE 77: The Bruins (21-12) put a rapid end to Tennessee’s 38th consecutive appearance in the women’s NCAA Tournament, blunting a second-half comeback bid and using an impressive performance by Michaela Onyenwere to secure an opening-round victory on the Lady Volunteers (19-13) in College Park, Maryland. KENTUCKY 82, PRINCETON 77: Taylor Murray scored 14 of her 19 points in the second half, and the Wildcats (25-7) beat the Tigers (22-10) in Raleigh, North Carolina. SOUTH DAKOTA STATE 76, QUINNIPIAC 65: Macy Miller scored 27 points and grabbed 11 rebounds to lead the Jackrabbits (27-6) over the Bobcats (26-7) in Syracuse, New York. IOWA STATE 97, NEW MEXIO STATE 61: Bridget Carleton led four players in double figures with 23 points and the Cyclones (26-8) routed the Aggies (26-6) in Ames, Iowa.